The damaged Cirrus after the forced landing. The Australian Transportation Safety Bureau (ATSB) has commenced an investigation into the forced landing of a Cirrus SR22 in the NSW lower Blue Mountains on May 10. The aircraft, N802DK, was flying from Bankstown when it experienced engine trouble over Lawson. The pilot deployed the Cirrus’s ballistic parachute and the aircraft floated to a forced landing in a suburban street, with the empennage breaking off and other damage being suffered during the landing. 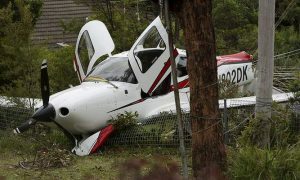 Neither the pilot nor the passenger were seriously hurt. The aircraft was a Cirrus demonstrator model which had been touring the country, and the pilot reportedly works for the company that makes the ballistic parachute. Amateur footage of the forced landing shown on television showed the aircraft drifting slowly to the ground under the large parachute canopy. The ATSB anticipates the investigation will take several months to complete.